So in October, I told you about my lil' sushi cravings from time to time, despite not liking sushi initially, in the post How to Make a Volcano Roll. 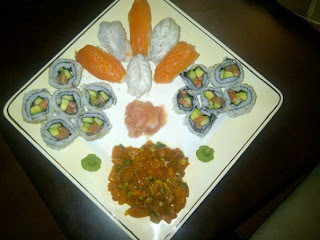 Well two of the very friends, I went to dinner with in that post have become quite the sushi makers. 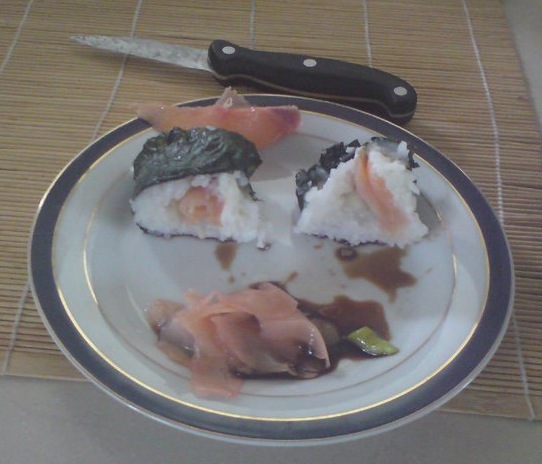 This afternoon, Mty posts this picture seen here with the caption, "My first attempt at making sushi." Three months ago, her sister Nandi posted an album entitled, "Homemade Sushi: My First Attempt and My Favorite Food in the World!" I was impressed with Nandi's attempt but today, Mty put Nandi to shame with this sushi platter! LOL! Don't you agree? LOL. Nandi is going to kill me. LOL! Anyway Mty says, "The hardest part is the rice and that's not too bad! The rest is creativity! It is so much cheaper." She then forwards me this video "How to Prepare Perfect Sushi Rice." Apparently, we can't make great sushi without perfectly cooked sushi rice. See how to prep, cook, season, and cool sushi rice, and we'll be rolling in no time! Lucians making sushi! Love it!